Time For A Quick Review! I hope that you are all having a good week! 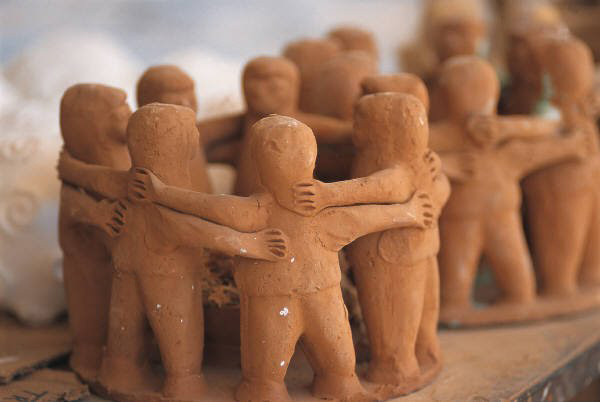 I know that we are all super busy and swamped, but we have a few BIG events left this week! Ground Control Shirts are here! End of meeting giveaway! Don’t miss it! Ground Control Shirts are in! If you ordered a shirt, stop by before or after the meeting tonight between 6-8pm to pick up your order. Thank you to all who ordered! Please note that we will have very limited passes to this event and spectators will need to pay to get into the event. Admission Fee: General Admission tickets to the Oconee Classic are $10.00. Ages 4-18 $5.00; 3 and under admitted free. GMEA and GHSA cardholders will be admitted for free. Please note that this week all Field Show Volunteers MUST be in ALL BLACK! That means BLACK shirt and BLACK pants! We especially need field show volunteers for Saturday! Legacy Of ChampionsWe need you! Did you know that volunteering at the Legacy of Champions is actually expected of all of our boosters/parents? All band students are required to work the entire day and parents/band boosters are expected to work at least one volunteer shift during the event, but highly encouraged to commit to working the whole day.The success of our event takes the support and efforts of ALL of our parents/boosters. So please take a moment and visit our volunteer page: https://chstrojanband.com/volunteer/ and review all of the various sign-ups available for the event. We specifically need help staffing gates and ticket booths, traffic controllers, fried Oreo stand, and general volunteers. We also need volunteers willing to bring desserts, lend ATVs, golf carts, and/or equipment trailers. There is something for everyone! 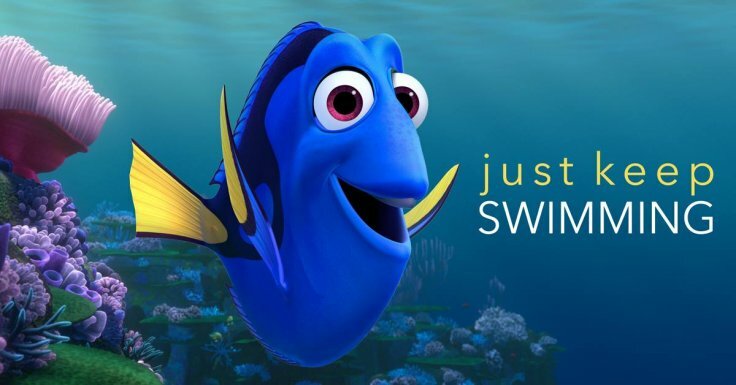 The most important part is to just be involved, so please take time to sign-up today! https://chstrojanband.com/volunteer/Don’t forget to attend the LoC information/training meeting as part of the General Booster Meeting tonight at 6:30 in the band room! Our Marching season is in full swing with Friday night football games and our fast approaching competition season. Believe it or not though we need to start preparing for the upcoming concert season, which will kick off with a Veteran’s Day concert on Nov. 7th. On Tuesday, October 3rd from 6:30 pm- 8:00pm we will be fitting students for concert attire. Once again this year the Squire Shop will be fitting the guys for tuxedo attire and the band uniform moms will fit the girls for concert dresses. New students will need to secure the concert attire and returning students should check to be sure the concert wear they have still fits properly. All students are required to have Concert Band attire before our first concert. *Disclaimers: The CHS Band, CHS Band Boosters or Carrollton High School does not guarantee, endorse, or warrant any of the items or transactions that take place between individuals selling/buying used concert attire. All deals, pricing, transactions, agreements, and claims are between the individuals who choose to participate in the event. All transactions will be conducted person to person via cash, check, or trade, without the involvement of the CHS Band, CHS Band Boosters or Carrollton High School. Those participating in transactions are doing so at their own discretion and risk. Posted in CHS Band and tagged #12tothemoon, #trojangold, #trojansallin, All-In-One Sale, Carrollton High School, Carrollton High School Band, Gold Standard, Legacy of Champions, Marching Band Competition on September 28, 2017 by CHS Trojan Band. 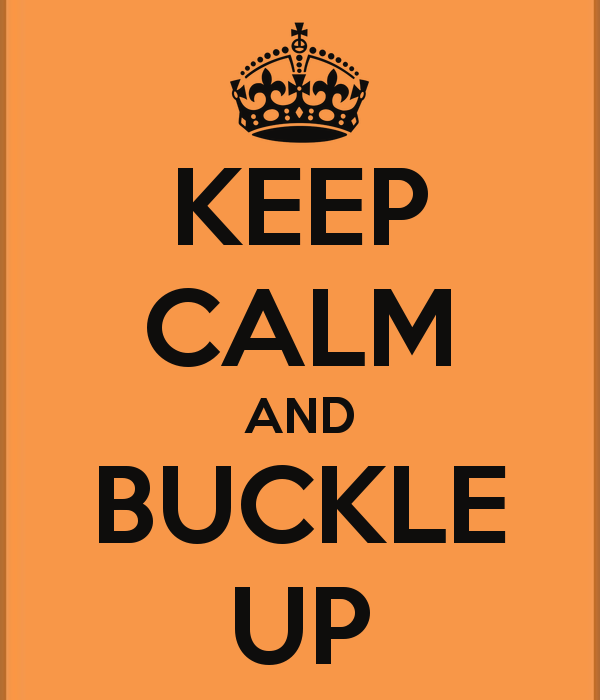 Buckle up and get ready for a fast ride! This week is packed with awesome events! Tuesday, September 26th is the Carroll County Band Exhibition. The event will begin at 6:30 at Central High School. There is a $5 charge for parking and tickets for the event are $6 per person. The following is the schedule for that evening. 6:45 PM ​Bowdon H. S.
7:05 PM ​Mt. Zion H.S. ​​7:25 PM ​Temple H. S.
7:50 PM ​Villa Rica H. S.
8:20 PM​ Carrollton H. S.
We need you! Did you know that volunteering at the Legacy of Champions is actually expected of all of our boosters/parents? All band students are required to work the entire day and parents/band boosters are expected to work at least one volunteer shift during the event, but highly encouraged to commit to working the whole day. Don’t forget to attend the LoC information/training meeting as part of the General Booster Meeting on September 28, 2017 at 6:30 in the band room! Posted in CHS Band and tagged #12tothemoon, #trojangold, All-In-One Sale, Carrollton High School Band, Carrollton Trojan Band, Carrollton Trojan Band Boosters, CHS Band Program, CHS Trojan Band, Gold Standard, Legacy of Champions, Marching Band Competition, Trojan Band Boosters on September 24, 2017 by CHS Trojan Band. As we settle into the week, the Band Boosters wanted to announce a few important dates and ways that we can all work together to support our band program. It is time to begin our All in One sale!! This is a long standing, and always highly anticipated fundraiser for the Carrollton High School Band! It is a fruit and meat sale, students will sell and collect money at the point of sale. Money and order sheets will be turned into the boosters and the purchaser will be responsible to pick up their order on November 17th or 18th at Tabernacle Baptist Church. This is an important fundraiser and we hope to see ALL of our students participating by selling!!! Please come to the band room THIS Thursday (9/21/17) between 7pm and 9pm to pick up your student’s packet. The candles will be delivered this Thursday, September 21st! This is sooner than we had anticipated! If your student sold candles, please pick them up this Thursday evening while you pick up your All-In-One packet. Candles will be available for pick up from 7 pm – 9 pm. The recognition for our top sellers will be Monday, October 9th at the end of regularly scheduled practice. Do you ever order from Amazon? If you do, you can order the same items on AmazonSmile for the same amount and a percentage of the purchase will be donated to the Carrollton Trojan Band Boosters. 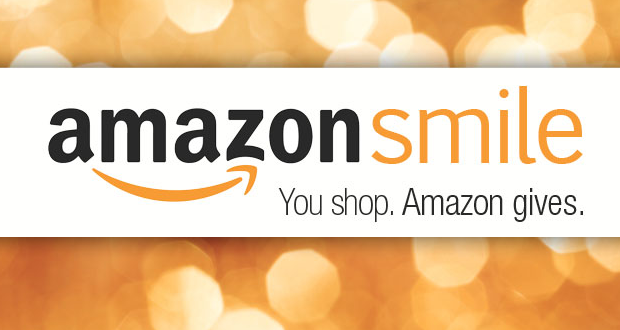 The AmazonSmile program is a give-back program where the online retailer, Amazon, donates 0.5% of the price of eligible purchases to the Carrollton Trojan Band Boosters to support our normal operations and efforts in supporting our band. This really is a effortless way to support our band without it costing you anything extra. 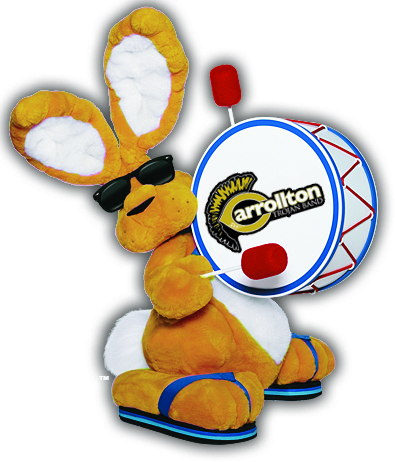 If you normally shop online with Amazon, you simply designate the Carrollton High School Band Boosters Club Inc. as the charitable organization that you’d like to support and that’s it… Your account will automatically be linked and then whenever you make your normal eligible purchases the band will benefit. It can’t get much easier than that to help! To link your account, follow this link: http://smile.amazon.com/ch/58-1572206 and sign in to your Amazon account. That’s all there is to it! Share this link with your family, friends, and co-workers too so they can support us as well. After linking your account, whenever your shopping on Amazon, make sure your shopping at smile.amazon.com and then look for the AmazonSmile logo in the upper left-hand corner of your browser window. That’s your assurance that your purchases will benefit our program! NOTE: AmazonSmile does not work with the Amazon App for mobile devices. If you commonly shop from your smartphone or mobile device you will want to place the items you want in your shopping cart via the app but then complete your checkout in a traditional web browser on your desktop, laptop, smartphone, or mobile device in order for the AmazonSmile donation to be made. As always, if you have any questions about any of these items, please make sure to contact the Band Boosters at: chstrojanbands@gmail.com. Posted in CHS Band, Fundraisers and tagged #trojangold, #trojansallin, All-In-One Sale, Carrollton High School, Carrollton High School Band, Carrollton Trojan Band Boosters, Gold Standard, Legacy of Champions, Marching Band Competition on September 20, 2017 by CHS Trojan Band. A Great Band’s Work is Never Done! Wow! I hope that everyone has had a great weekend, but what a terrific night on Friday Night! It is always amazing to see everyone come together to make sure our kids are successful. Volunteers providing selfless service to feed our kids, make them look awesome in uniforms, load equipment, haul equipment, hand out and take up plumes, chaperone, double check that the stands and buses are clean, and provide physical and emotional support for everyone involved with the Trojan Band! Thank you for spoiling our staff and students with all that you help make happen. And our students absolutely shined! Because of where I was standing, I thought that we had a few blemishes that were unexpected, but then I saw a video of the performance and was blown away by our Trojans’ performance! So proud of our students. Then after an amazing halftime, the kids worked extra hard to help our team focus on the game, hyping them to a nail biting finish! It was an exciting night and I look forward to another one this Friday as we take on Woodland High School! Please go to the following link to sign up to volunteer this Friday! We would love anyone signing up for field show help, to come to Thursday night’s practice at 8 to practice getting the props on and off the field! We will plan to tailgate Friday before the game. More information to follow this week. District Honor Band is a competitive opportunity for our students to excel individually. The students practice scales, etudes, and sight-reading for an audition on December 9 at East Paulding High School. The audition decides chair placements for the District Honor Band and is the qualifying round for the All-State auditions in January. District Honor Band auditions cost $10 and All-State Auditions are $25 (to be considered for the second round of auditions and District Honor Band the total is $35). Please sign-up here: https://goo.gl/s33kbv and turn in money to Ms. Dothard by Friday to sign-up for auditions. Students are often skeptical if they are ready to audition, but I highly recommend our students set this individual goal to give them a reason to practice and improve. Even if they do not make the ensemble, by setting the goal and putting in extra practice they practicing goal setting and improving. Additionally, being able to list District Honor Band and All-State as accomplishments increases marketability for scholarships when apply for colleges. Reminder: The county exhibition date has been changed! The date is now, September 26th! The event will begin at 6:30 at Central High School. There is a $5 charge for parking and tickets for the event are $6 per person. The following is the schedule for that evening. We will have a general Booster member meeting on September 28th at 6:30 pm in the band room. This is an important meeting. We will be learning about the Legacy of Champions, Dr. Albertus will be speaking to us, and we will learn about the All-in-One fundraiser. We hope to see you all there! 2 Days left to order a Ground Control Shirt! Regular Shoppe hours this week: Thursday September 21 from 5-6:00p and 7:30-8:30p and Friday, September 22 (game day) from 5:30-6:30p. If you have not picked up your show shirt/booster shirt order, please stop by during regular hours to pick up or email: Trojanbandshoppe1@gmail.com to make other arrangements. We do have a limited supply of show shirts and band booster shirts still available for purchase if you forgot to purchase! 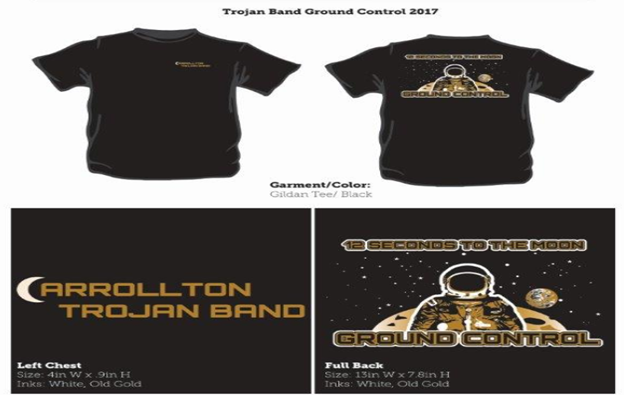 Posted in CHS Band and tagged #12tothemoon, #trojangold, All-In-One Sale, Carrollton High School, Carrollton High School Band, Carrollton Trojan Band Boosters, Gold Standard, Legacy of Champions, Marching Band Competition, Trojan Band Boosters, Trojan band spirit wear on September 17, 2017 by CHS Trojan Band. Hello! 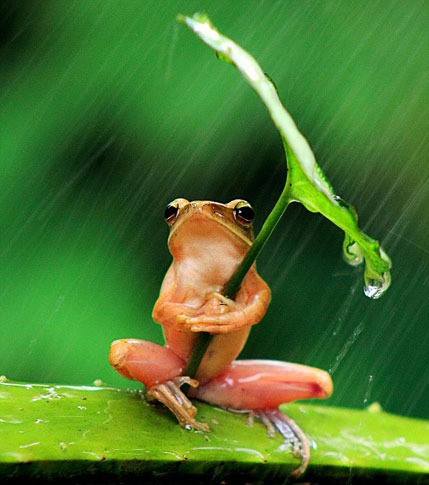 I hope this update finds you all safe and dry! We will obviously not have band practice Tuesday, since school is still closed. Carroll County Exhibition: The county exhibition date has been changed! The new date is, September 26th! The event will begin at 6:30 at Central High School. There is a $5 charge for parking and tickets for the event are $6 per person. The following is the schedule for that evening (Full itinerary will be released as we get closer to the event). 6:45 PM​ Bowdon H. S.
​7:25 PM ​Temple H. S.
Band Booster Meeting: We will have a general Booster member meeting on September 28th at 6:30 pm in the band room. This is an important meeting. We will be learning about the Legacy of Champions, Dr. Albertus will be speaking to us, and we will learn about the All-in-One fundraiser. We hope to see you all there! As we continue to prepare for the Legacy of Champions that takes place on October 14, 2017, we wanted remind you of how you can get involved and provide additional support in other ways. We need your help with ATVs, golf carts, trailers, food, and fulfilling volunteer duties the day of the event. Please see below for details about each need. These motorized vehicles & trailers will be used for hauling the equipment for the various bands that will be performing at the competition. We can use either four wheelers, utvs, etc. These vehicles will need to have a trailer hitch for pulling a trailer. We are in need of 10-12 or more of these vehicles. The golf carts will not be used to pull trailers but rather used by staff in the performance of their duties. We are in need of 8 or more of these vehicles. Our competition hosts one of the best hospitality rooms in the state! We do this by spoiling our guests rotten with comfortable surroundings, Southern hospitality, and great food! So to ensure we continue this great tradition, we need your help with the “great food” part. Please visit this sign-up: https://www.charmsoffice.com/charms/volunteerR.asp?s=carrgahsb&v=3866155 and volunteer to help out with this need. Posted in CHS Band and tagged #12tothemoon, #trojangold, Carrollton High School, Carrollton High School Band, Gold Standard, Legacy of Champions, Marching Band Competition, Trojan Band Boosters on September 12, 2017 by CHS Trojan Band. Band Signing Day May 7, 2019 at 2:30 pm – 6:51 am Senior Signing Ceremony in the Band Room. For seniors and their parents.